My 16" wok from the Wok Shop in S.F. is scheduled to arrive today, I've picked out the recipe from the Breath of a Wok I plan to do and have all the ingredients in hand. Thanks @Village_Idiot for the referrals! Just waiting impatiently for the wok to arrive so I can season it. I am totally new to this type of cooking and newish to the Egg so I have a couple questions regarding time and temperature. 1) I am assuming the times and temperatures in Breath of a Wok are written with a stove in mind. I don't know what temperature they were assuming for the typical stove/range-Any ideas? 2) I am assuming one of the reasons for using the Egg is that you can go higher with your temps than with an indoor range. 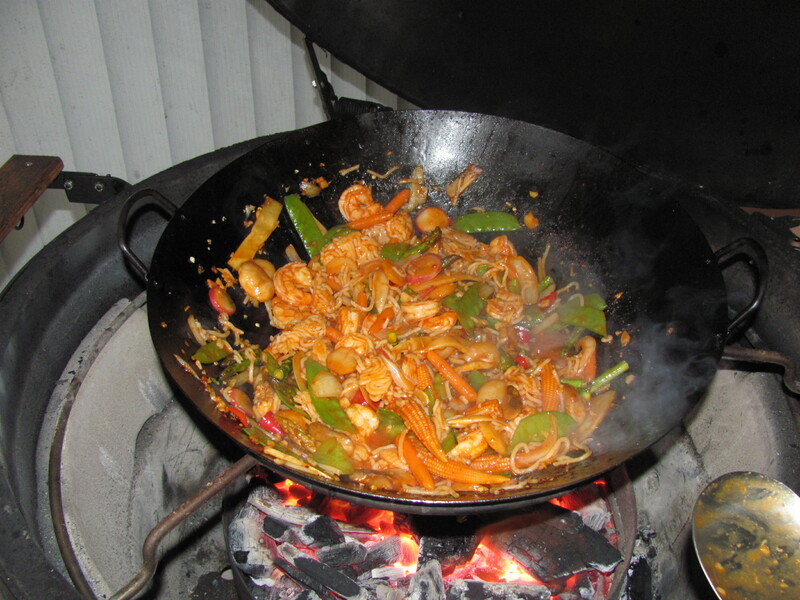 What temps do the Wok Eggsperts get their Egg up to before woking? 3) Do you keep the lid down to heat the Egg and then raise the lid and put the wok on to preheat once the Egg is at the target temperature? 4) The reason I was asking about stove temps vs. desired Egg temp was to see what it does to time in the recipe. For example these are just made up temps but if it is cooking at 350 on the stove and you do it at 700 on the Egg does that half the time? Do you guys have some rule of thumb you use to adjust recipe cooking times when you make them on the Egg? I know you cook it till it's done, but I don't know what that looks like nor how long that takes. You'll want the Egg as hot as possible. Yes, close it up to raise it up to temp (I go to at least 700), then burp, open and heat your wok; leave the bottom vent wide-open. Even on a stovetop, cooking times are only a rough estimate; you'll quickly get a feel for how long things need to be cooked before they're done. There's some good videos of stir-fry cooks on this site, they'll give you a good idea. I'd start off with about 500°. As you get more proficient, you can raise that. In theory, the hotter, the better because you seal in the nutrients and flavor the quicker you cook it. However, I've come to realize that there is a limit. I used to put the garlic in the oil first, but it got to the point that the garlic turned brown (burnt) the second I put it in the wok. I've since kept the fire down to about 800° or 900° (estimated) and now add the garlic more towards the end of the cook. I think I read in one of Grace Young's book that professional Chinese chefs cook on a fire 20 times hotter than a stove will get, which I'm sure, is a lot hotter than 900°. But, they are pros with many years of experience. I agree with VI. Start slow and once you get the hang of it, let her rip! 1.) Have everything cut up and in separate bowls next to your egg ready to go so you can cook in small batches. 2.) Have a pot with a lid nearby to put each finished batch in as you go. 3.) Don't worry about cooking times, use a fork on the vegetables to check for doneness. 4.) Throw it all back together at the end and mix your finishing sauce in. 5.) I get the egg up to about 500-600 and leave the lid open the whole time. There's no time to close the lid, you need to stir constantly at that temp. A lot of good advice here. You don't want to make soup, but you don't want it too dry either. You need a puddle of sauce and moisture in the bottom. Thanks everyone for the great advice! Sadly FedEx Ground messed up. Once it got dark I kept checking my front and side steps every 30 minutes for my package right up until 9 PM and there was nothing. This morning I get up to find they claimed it was delivered at 7:25 PM to my front steps. I was in my Living Room and there is no way a big Fed Ex truck pulled up to my house and I didn't hear it. Plus it wasn't there when I checked at 7:30. Arrrrrrrrgh. In any event I don't find out anything until Tuesday now. Arrrrrrgh. So I have printed out this page to keep until the day they find my Wok or they get me a new one. The EXACT same thing happened to me with UPS last week. Two days later, a neighbor that lives 5 houses down brought it to me. Thanks VI I get up at 5AM and I took a walk around the neighborhood to see if it was sitting on someone's front steps and I will talk to the neighbors. Sadly it was shipped with no signature required (not my choice). Do check your neighborhood for the package. My calibrated tools were addressed incorrectly. Luckly I have so many packages delivered to my house the FedX guy called me to verify my address before he left the $5000 worth of calibrated tools. Ha, without going into details I get shipments of an item that carries a $50 hazardous waste rider, and which is supposed to be signed for. Every single time I come home have find the crate just sitting on my front pourch. I've been in a HAZMAT class all last week for work. Thats might be a big deal if they got caught. There are lots of other folks I know who experience the same thing. Jim, I'd start out by stabilizing my Egg around 500-550. 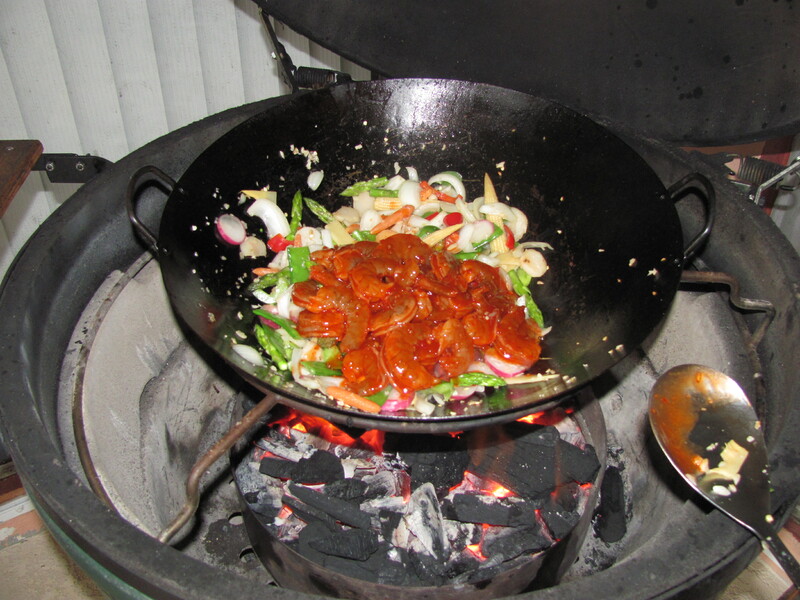 When its ready to go, put the wok in for a few minutes to heat up. Once its hot, shut the bottom vent and start woking. I never close my lid when woking, just keep it open the whole time. I hope you have a set of welders gloves cuz its gonna get hot. I hope you have a set of welders gloves cuz its gonna get hot. Indeed. 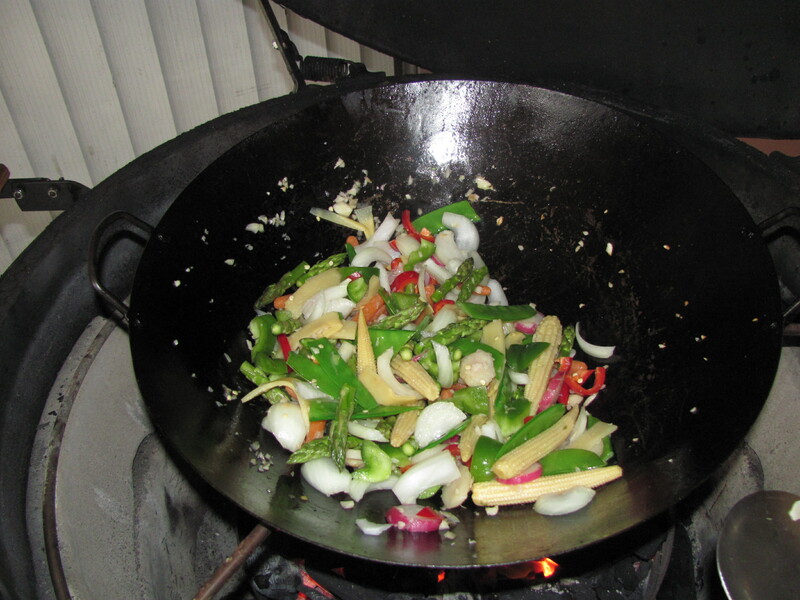 My first wok, I wore welder's gloves when it was time to take off, and within a few seconds it was so hot that only my experience welding allowed me to set the wok on the deck instead of pitching it. I had a huge blister on one hand. No glove will prevent the heat coming in, it only delays it. Now I use gloves, and a second set like a pot holder. I also only move from the hot Egg to the nearby cold Egg.